Let's get real before we go too much farther, increasing your metabolism naturally is both a progressive and on-going endeavor. For some reason, people get the idea that if they change their eating habits for a couple of days, put in a week of intense workouts, and drink gallons of water...and they will see 3" come off their abdominals by Saturday. Reality does NOT work that way. The one fact you must always keep in mind is: It took several years to accumulate excessive belly fat and love handles...it will take both TIME and EFFORT to get rid of them. I will tell you up front to set evaluative markers at 25 weeks and 36 weeks. I understand that some people will stop reading right here because they heard there are "secret supplements" and "underground home workouts" that blowtorch off body fat in less than a month. Those promises are all over the Internet and the guys hyping them make extremely good money. Think about it. If that for real, all the gyms would close and every male on the planet would look like an NFL defensive back. Do you really think that is going to happen? Once again, getting rid of belly fat and gaining lean muscle tissue are both progressive...and both take time and effort. The best strategies to increase your metabolism naturally have been around for decades, but people blow them off because they sound so basic...and because they require too much self-discipline to get results. Eat breakfast every morning: This is the most important meal of the day. You need to fuel your body to start the furnace burning. Make good food choices...no sugar foods, no processed foods. People who do not eat breakfast end up consuming far more calories than needed during the day. Get plenty of fiber-rich foods in your diet: Oatmeal, fresh fruits, leafy green vegetables, and beans are all packed full of nutrients and make your digestive system work hard. Eat 5-6 small meals each day: You will naturally increase metabolism when you keep your system stoked all day. When you skip meals or eat too large of portions, your system fears starvation and starts screaming, "Save the fat!" Drink more water: The benefits of drinking water are understated. Progressively work up to drinking a gallon per day. When you get the least bit dehydrated, the body fears it will NEVER see water again and starts storing fat for survival. Start working out with weights: Lean muscle burns 3X as many calories as fat cells. Weight training for women is almost a given these days. You'll build lean muscle...NOT bulky muscle. Do some kind of cardio everyday: Get away from the computer, get away from the TV, get away from your cell phone and...MOVE. Get outdoors and walk briskly for 30-45 minutes. Build up until you are strong enough to run. When you get even stronger, start adding interval workouts like Olympic and professional athletes use to burn belly fat. To naturally increase metabolism does not have to be complicated, but it does take a commitment to making good food choices and getting regular and consistent exercise. 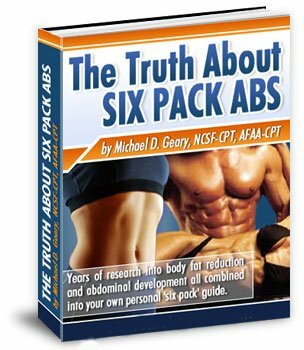 The Truth About Six Pack Abs is the best-selling program by Mike Geary. He has helped thousands of men and women get rid of belly fat, thigh fat, love handles and naturally increase metabolism so that they keep fat off permanently. * His program focuses on you learning how to make good food choices a part of your lifestyle. * You will learn exactly what foods build lean muscle to increase your metabolism naturally, and what foods are stored as abdominal fat. * He provides eight increasing levels of strength building workouts for lean muscle and eight different levels of abdominal workouts. * Mike's program is easily downloaded to your computer desktop. It comes with a 60-Day 100% Money Back guarantee. If you have been looking for a program to naturally increase metabolism in order to lose belly fat and get rid of love handles, The Truth About Six Pack Abs is worth your careful investigation. What is the Lean Hollywood Look and why do women desire this in men?